1. Should tweet "you have a useful, sharing interesting things or giving useful information. Instance, when you come across an article or a link that is considered good, share the link via your tweet. 2. Others to follow were followed. This is the most simple, easy to do. 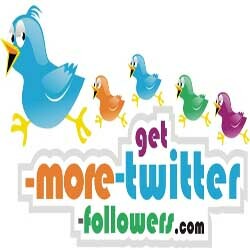 Try to keep the ratio of 1:1 following and followers you. 3. Bio and profile picture do not emptied. Because other people are looking at going indifferent if not see anything in your profile. Write something about yourself and upload your own photos and not someone else's photos, it's better. 4. If have a blog or website, please provide the link in the profile biodatamu. Web you will provide more detailed information about yourself, and also in addition to increasing the number of visitors to your website. 5. Do not hesitate me ReTweet (RT) tweets that you find useful and get on the followermu. They will also do the same thing to you, and your name will appear on their followers. 6. Tweet about what you think. Be yourself, do not need to be part of it. Make me trend with your own style of course. 7. Orderly, disciplined, it is always necessary. Tweet lah regularly, every day is highly recommended. People may mengunfollow you if they see your last tweet a week ago or more.